Anyone who visit the town of Lake Sebu in South Cotabato, known as the Summer Capital of the South and the Land of Dream weavers are guaranteed of great memories, may it from the people's culture, the scenic destinations or from the exciting adventures. Not only that, one can also fill their luggage with souvenirs items unavailable elsewhere in the world. From bead necklaces, brass wares, wooden items, to T'boli dolls, T'boli musical instruments or the intricately woven T'nalak fabrics. 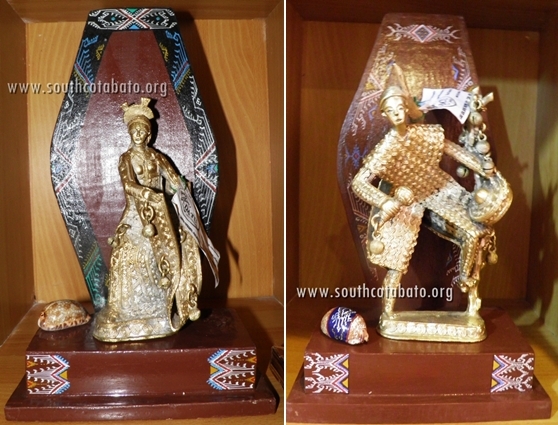 Check out the following photos of some Lake Sebu souvenirs. T'boli dolls. 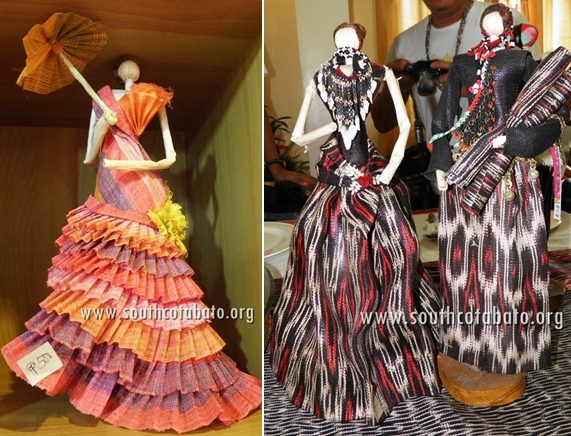 Made with indigenous materials, price ranges from P500 - P1,000 each. Colorful bead necklaces, bracelets, ID holders, etc. T'boli women in Lake Sebu are engaged in bead making, one of their traditional arts passed down from mothers to daughters and has become one of their livelihood. Bags, modified T'boli attires, coin purses, T'nalak fabric, and other T'nalak inspired items. T'nalak is an indigenous fabric from abaca that was made through a centuries-old process by T'boli women of South Cotabato. T'nalak is also the ultimate cultural emblem of the province. Brass wares and wood carvings. Using woods and other indigenous materials, T'boli men produces indigenous musical instruments for souvenirs and other wooden items with indigenous designs. The T'boli's are also master brass casters, as can be seen in their produce of brass belts, bells, bracelets, anklets,etc. Located just few meters from Punta Isla Lake Resort and T'boli Museum at Tuko Fol, Poblacion, Lake Sebu. It is a one-stop shop for all your souvenir needs. COWHED has an assortment of traditional T'boli handicrafts like t’nalak, beads, embroidery, brasswares and wood carvings. With its strategic location near the Tourism Office at the town center, it is one of the most visited souvenir shops in Lake Sebu. K'datu Souvenirs and Pasalubong Center's products and services includes T'nalak Cloth, T'boli dolls, brass casting, wood and bamboo products, bead works, modified T'boli attire, award crafts, musical instruments, corporate giveaways, costume rental, embroidery and others. It is located along the main road in Poblacion, Lake Sebu. Also sells ethnic accessories, t'nalak fabrics, costumes, brassworks and more. Go to Lake Sebu's T'boli museum and be an spectator in learning about the culture of the T’boli people. Tourists may also purchase souvenir items here, but offers only smaller quantities of souvenir items compared with other privately owned souvenir shops. Located at at Sitio Tukolefa, Lamdalag, Lake Sebu, it is better known as Lang Dulay's training center where one can find genuine T'nalak fabric souvenir from the Gawad Manlilikha ng Bayan awardee and master dream weaver of the T'boli's, Be' Lang Dulay. Gawad Manlilikha ng Bayan Center is about 15 minutes away from Poblacion, Lake Sebu. Remember to always bargain for the cheapest price when buying Lake Sebu souvenirs and enjoy your shopping!